By the author of breakout WW II era alternate history Himmler’s War and Rising Sun, a compelling alternate history thriller. 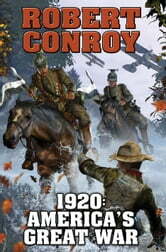 After winning WW I, Germany invades America in 1920, marching through California and Texas as a desperate nation resists. Consider another 1920: Imperial Germany has become the most powerful nation in the world. In 1914, she had crushed England, France, and Russia in a war that was short but entirely devastating. By 1920, Kaiser Wilhelm II is looking for new lands to devour. The United States is fast becoming an economic super-power and the only nation that can conceivably threaten Germany. The U.S. is militarily inept, however, and is led by a sick and delusional president who wanted to avoid war at any price. Thus, Germany is able to ship a huge army to Mexico to support a puppet government. Her real goal: the invasion and permanent conquest of California and Texas. America desperately resists as the mightiest and most brutal army in the world in a battle fought on land, at sea, and in the air as enemy armies savagely marched up on California, and move north towards a second Battle of the Alamo. Only the indomitable spirit of freedom can answer the Kaiser's challenge. Thought provoking story.Well put together . good fictional characters mixed with real historical characters. But for fate could have really happened.Cant wait to read another by Mr Convoy. A fine book, but perhaps not quite as well-researched as some of his earlier works. Plus I have a sense of him trying to "finish-up" with the historical result. And an armoured cavalry charge is a bit much to believe, and strains credibility just a bit too much. Still, it is a well-written book on the whole, and I commend it to Mr Conroy's American fans in particular. Good book...hard to put down!